The 2019 Acura RDX crossover arrived at Findlay Acura June 1. Evidence of the success of the vehicle is the fact that models are being pre-sold and delivered as soon as they arrive at Findlay Acura, at 315 Auto Show Drive in the Valley Automall. According to internet team leader Travis Aguilar, the ’19 RDX is popular for numerous reasons. Aguilar explained that the all-new 2019 model offers an impressive array of standard safety features, dubbed the AcuraWatch Package, which includes adaptive cruise control with low speed follow, forward collision warning, collision mitigation braking and lane keeping assist. If buyers opt to add the technology package, they’ll also receive blind-spot monitoring system, along with front and rear parking sensors. Advance models are further enhanced with a surround-view camera system, which is the first time it’s been offered on the RDX. In addition, all models include a panoramic sunroof, Apple Car Play, a newly redesigned body and substantially more torque, along with Acura’s premium audio system. An available upgrade for performance-minded drivers is Acura’s Super Handling All Wheel Drive (SH-AWD). The power package includes a 2.0 turbo with 272 horsepower and 280 foot-pounds of torque. With its handling and horsepower, the ’19 RDX is not only responsive but true to its word. 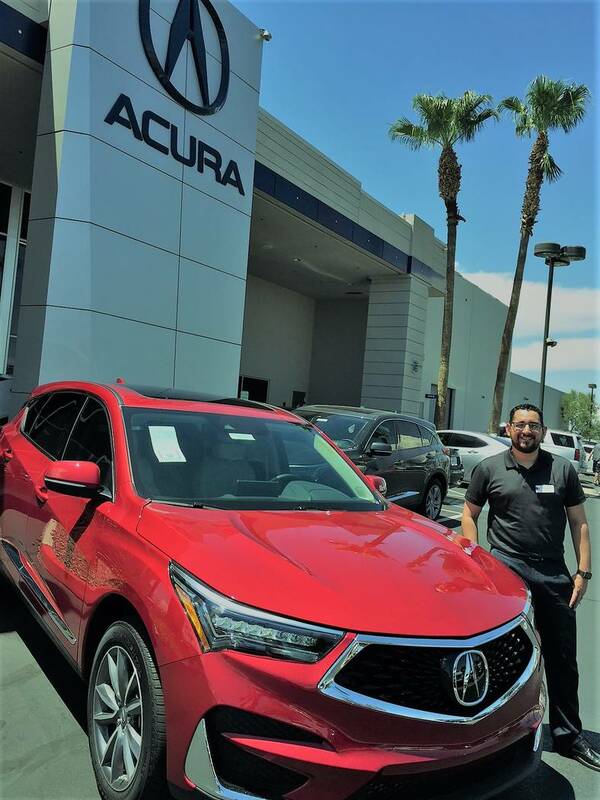 The Findlay name was a key reason why Aguilar joined the Findlay Acura. The buyer profile of the Acura RDX is diverse, added Aguilar. Findlay Acura is headed by general manager Kevin Hicks. The dealership is part of Findlay Automotive Group founded in 1961 by the late Pete Findlay, whose son, Cliff, now oversees 32 dealerships in Nevada, Utah, Arizona, Idaho and Oregon. Further information regarding Findlay Acura can be found by calling 702-982-4100 or by visiting www.findlayacura.com.